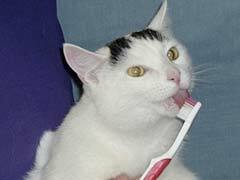 How important is it to take your cat in for cat teeth cleaning? Cats can suffer from extreme tartar buildup that, if left untreated, can lead to infection. While it is safe to say that a good cleaning is necessary to the oral health for cats over a certain age or with marked tartar buildup, it’s hard to know when to say when. Before you take your cat in for a cat teeth cleaning, look over these risks and options so that you can make a well-informed decision. Many proponents of teeth cleaning for cats will argue that the benefits to your cat dental health far outweigh the risks, and it is true that the risks are minimal. The greatest risk is in the fact that any cat who goes in for a cat teeth cleaning will have to be put under general anesthesia. As with any person or animal going under general anesthesia, there are always inherent risks. However, today’s technology has pared those risks down to a minimum. Another risk is that your cat may lose teeth in the cat teeth cleaning process. But that means that those teeth were only held in by tarter in the first place and were therefore prone to infection. Whether or not your cat is ready for a cleaning, there are preventative options you can incorporate into your daily routine. Cat dental chews are a inexpensive and fun way to tend to your cat’s oral hygiene. What your feline friend thinks is a toy is a safe way to keep tartar buildup at bay. Purchasing dental diet cat food is a good idea, especially as your cat gets over the age of seven. If you are confident it’s time to get a cat teeth cleaning, remember that it can’t hurt anything but your pocketbook. Many savvy cat owners these days are opting to perform the cleaning process themselves. Whatever you opt for, know that your cat will be better for it and you’ll be the lucky owner of a happy cat.